Electrical switchgear engineers NOJA Power have today announced a new success case with their longtime utility partner ENEL for the NOJA Power OSM Series Automatic Circuit Recloser (ACR) using their Auto-Changeover (ACO) functionality. The First project installation for an ACO scheme using NOJA Power OSM Reclosers began in 2014 during the FIFA World Cup, when Brazilian utility ENEL installed two OSM Reclosers outside Castelão Stadium for energy continuity and reliability. In the lead up to the world cup, the Castelão stadium in Fortaleza City was expanded to seat 67037 patrons, and the associated services upgrades such as the ACO scheme are still in service for future events. The ACO scheme is designed to provide reliable energy supply in the case of network supply issues, whilst providing protection functionality for the critical supply asset. Whenever supply fails on the main supply line, the OSM Reclosers are configured to switch supply source safely, providing reliable power supply to the critical asset. Following the positive experience and the assistance provide by the NOJA Power Brazil team during the project in Castelão, ENEL has replicated this scheme in many other critical energy supply applications. One of these projects is the Iguatemi Fortaleza Shopping Mall, one of the biggest shopping center in the state, servicing 1.6 million customers monthly. The ENEL Ceará team applied an ACO scheme at the shopping center to guarantee the energy supply for the venue. Another example is the ACO installation supplying the Dr. José Frota (IJF) Hospital Institute, the largest hospital in Ceará State. 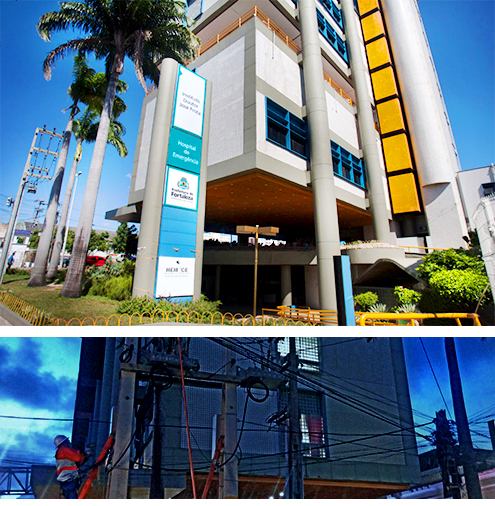 As a critical research facility for Orthopaedic Surgery, power continuity is of utmost importance at the site. With the successful history of ACO installations, NOJA Power were entrusted with providing the assets to achieve power continuity at the site. The commissioning at this site was supported by the trained technical team of NOJA Power’s South American subsidiary, NOJA Power Brazil.